Not content with banning the use of benefits for the purchase of alcohol or tobacco some US states are now eyeing gambling. Imagine the outrage in NZ if even the first was proposed (although I am not sure how it is effectively enforced). There would be a vigorous human rights debate calling for beneficiaries to be allowed to spend their money in the same way as anyone else. But there would be no individual rights debate about the philosophical problem of removing one individual's property to furnish the lifestyle of another's. Welfare recipients have long been banned from using their benefits for alcohol and tobacco. Some state lawmakers are eyeing the vice of gambling, a move some advocates for the poor see as unnecessary and unfair. "What a pointless exercise. Going to jail didn't change my views. It didn't rehabilitate me. It didn't make me remorseful, make me feel that I would never do it again. If one of my sons was suffering interminably and asked me to assist, I would." Probably the most useful thing she achieved in jail was cataloguing Arohata Women's Prison's 4000 library books, and guiding some of her fellow inmates to better reading. "When they first come in, they want books about crime and drugs and bulldogs and demons and dragons. Then you see the rehab start to work, and they'd read Maori culture and mana, self-help books, poetry, books about peace. Nice fiction." Funny. I'd read a book about crime and drugs any day over a self-help book. And you can give me bulldogs over poetry too. I must need rehab. Updating artist blog. Working yesterday in Tawa, nothing gives me more pleasure than school kids getting excited about what results can be achieved with a few pastels. A couple of ten year-olds chatted at length (how can you see green and purple in a dog? How do you make things look near and far?) and then left, armed with tips and insights, to hopefully try drawing their own black labrador. Increasingly I am thinking about teaching but need to explore possibilities. Not being academically trained I don't want to pass on bad habits. But I keep getting asked if I do give lessons and hate saying 'no'. Here I started with an error. I used the side of the paper with bolder texture. But whenever I make a mistake I persevere to see what can be salvaged. This table is from the Cato blog. Obviously the deep US recession has contributed to soaring costs but those areas equivalent to the DPB (TANF), IB abd SB (SSI) are reasonably contained. That is because there is a much stronger focus on providing assistance in kind rather than in cash. And Medicaid, public health provision for uninsured low income working age Americans, makes up most of the absolute increase (contrary to what many leftists believe - that there is no public health provision in the US). The figures relate only to federal spending. 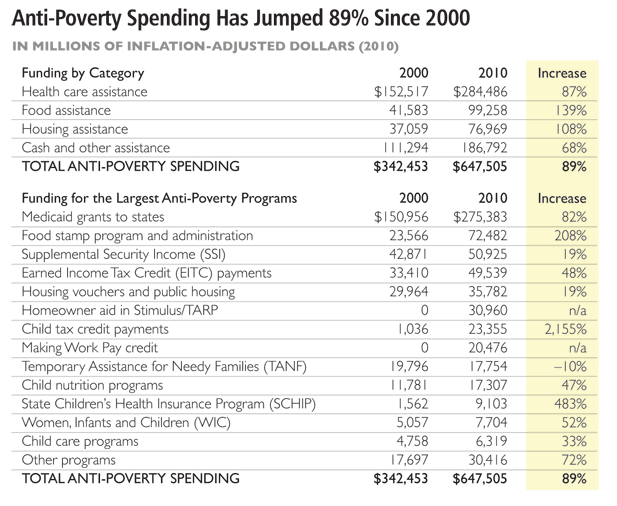 States spend on their own anti-poverty programmes. In the case of TANF, from memory, spending equates to around 70 percent of what the federal government puts in. A comparison to NZ is difficult. Cash spending (minus Super) has risen from $7.8 to $12.9 billion (non inflation adjusted) but it is impossible to extract health spending on low income families alone. Housing (not including the accommodation supplement which comes under cash spending) has risen from roughly $68 to $365 million. The figures are based on Core Crown expenditures. Matchbox calculations, if those totals are divided by population NZ spends around $3,000 per head (excluding health) against the US at $2,100 but remember that the US spending is only federal and US dollars are worth more. Their poverty threshold is around US $11,000 for one person. 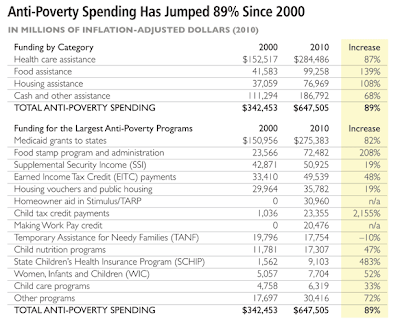 A large chunk of left liberals seem to think NO money gets spent on the poor in the US. The police have issued some new statistics relating to various measurements of crime prevention, crime detection and crime reporting. They compare monthly statistics for August 2009 to August 2010 and can be viewed nationally or by district. From these graphs it is noticeable that where more crime prevention measures are applied less crime is reported. Unfortunately the input isn't consistent across the country. For instance I have compared Counties Manukau with Lower Hutt on just a couple of measures. In the Hutt 'foot patrols' have almost halved and 'vehicle thefts' have risen. In Counties Manukau the opposite applies. This isn't necessarily consistent across other areas but it is clear that the police are putting resources into particular areas (functional or regional) at a cost to others. It would be interesting to see what plugging in all the various data shows. That of itself is interesting because leftists usually link increased poverty (recession) with increased crime. This is however a comparison between months - not years. Why did the NZ Herald use this photo with this story? The following is in cached form only. The site has disappeared. Over the years I have heard bits and pieces about the 'sisterhood' conspiracy but haven't seen it laid out in print (I don't read Wishart). Not sure I follow the logic re the motivations of government and cannot tell whether the writer approves or disapproves of feminism. But the way I see it, work-testing single parents should strengthen the family in the long-term, which would be a blow for the radical feminists who sought to destroy it as an institution. Why? Because many women want to raise their children personally and to do that they need a supportive partner. Single mothers are being forced to work - but why? There’s quite a few single mothers unhappy with our leading single mother, MP Paula Bennett at the moment for her openness about single mothers working when their children turn 6 years of age. If you walked into a WINZ office and said MP Paula Bennett was terrific, you’d cop it from both sides of the counter. The strangest part is that single parents have been forced to work for years yet it’s been so subtle, they’ve not noticed it. I can only assume single mothers on the DPB thought everything they’ve been offered over the past years was to make their life more comfortable and to give them choices. Maybe, they’ve never stopped to question what the cost would be. Well, I think it would be a good time to look at the bigger picture and explore the reasons government would give money away – after all, they would never do it unless there was a pay-off for them whether cost saving or profit…… Funny, single parents do both. Anyways, the first thing I’d liked to share is a bit of history because to understand the present and future, you need to understand the past. In England prior to 1857, only an Act of Parliament could permit a full divorce allowing remarriage and it could only take place in England. This was very expensive so 10 years later the Divorce and Matrimonial Causes Act was passed in New Zealand which meant the judgement on divorce proceedings was passed over to the courts where it had to be heard in Wellington before three judges. A husband could divorce his wife on the grounds of her adultery while a wife could divorce for cruelty, desertion or bigamy. In 1881, it was changed from three judges to one judge and all the way up to 1968 law changes were made to give up to 24 grounds of divorce and lessen the time to wait. Divorce rates rapidly rose in the 60′s and 70′s with all these new ‘faults’ as ground for divorce, making the way for even further changes. In 1980 the Family Proceedings Act was passed that removed divorce from the High Court to the newly created Family Court where for legal purposes, the term divorce became ‘dissolution of marriage’, and with it came ‘No fault’ where an application for dissolution on the grounds that the marriage had broken down irreconcilably, could be made jointly or by either the husband or wife, provided they could satisfy the two-year separation requirement. There were 4 divorces in 1857 while now one third to 50% of marriages end in divorce (research varies). Added to this are women and men living in de facto relationships, women by choice being solo mothers through sperm donation and men being solo fathers through surrogacy. The Old Age Pensions Act 1898 established the basis of the present welfare system. During the following 30 years the pension system was extended to include widows (1911), Maori War veterans (1912), miners (1915), and the blind (1924), while the size of the pensions was steadily increased and conditions of payment were made less stringent, though always subject to a means test. In 1926 family allowances were introduced at the rate of 2s. per week for each child in excess of two, again subject to means testing. The passing of the Social Security Act 1938 allowed for welfare to be extended for anyone in hardship including unemployment, sickness and invalids. The principle of the means test was abandoned with respect to superannuation benefits and medical benefits and, to emphasise the contributory nature of the scheme, the term “benefit” was substituted for the terms “pension” and “allowance”. The 1973 Social Security Amendment Act introduced the Domestic Purposes Benefit to New Zealand’s social welfare system so that widows and single mothers could stay at home to take care of their children. Today there is 97,000 single parents on the DPB and in the year ending 2009, 10,000 extra single parents applied for the DPB. (Dr. Mary Jo Bane, feminist and assistant professor of education at Wellesley College, and associate director of the school’s Centre for Research on Woman). How does feminism affect women today? Feminist and Communist Kay Goodger attended the first-ever feminist United Women’s Convention as well as Helen Clark, Margaret Wilson, Marilyn Waring and Silvia Cartwright along with nearly 2 thousand other women. From this convention came the attack on the traditional family. It was concluded if they could crush the family, break it down or have it sidelined as irrelevant or portrayed as no better than other methods of child rearing, radical feminism could set the agenda for centuries to come. Goodger’s 1973 plan was to make a utopian future for “Amazonian” reflecting what she believed was once a reality. She called on radical feminists to do all they could within political parties, government departments and communities. Goodger back in 1973 knew that if women could work and children were raised in childcare the family would suffer a body blow. Radical feminists following this woman are intending to have Government funded 24 hour a day childcare. As of 1st July 2007, 20 free hours daycare was given in Australia and New Zealand and Europe with Australia forcing single mothers on the DPB to work and New Zealand encouraging women to decide for themselves work is the right choice. Sweden has compulsory childcare from the age of 1. Margaret Shields says, “We began to reorganise the Women’s Section of the Party so that it became an agent for change; through organising, training and encouraging women to take a larger, more strategic role in politics” She says things are not done by accident. This was the 30 year plan the sisterhood made from their list of demands. Reference: Investigate Magazine, May 2005, page 39. Kay Goodger is now a senior Government advisor on policy initiatives earning hundreds of dollars an hour in pay, still mixing with Marxist organisations in Europe and is mentioned in dispatches on the website of the Portuguese Communist Party. Margaret Sheilds is a former Minister of Customs and organised the 2005 conference for women. Helen Clark was New Zealand’s Prime Minister and now works in the United Nations making a global tax. Marilyn Waring is Ruth Richardson’s replacement on the board of directors of the Reserve Bank. Silvia Cartwright became the 18th governor general of New Zealand. She also became the first female high court judge. As you can see, single mothers working and placing their children in childcare is a feminists issue. It doesn’t matter if the left or right wing political parties have power for either way, women will proceed with the plans of feminists from 1966. The DPB traps single parents in poverty as it’s just a means to make ends meet. On top of this, working part-time does not add extra wealth but rather takes away extra money single parents receive such as accommodation supplement, disability, childcare costs and temporary additional support. It can also put a single parent above the financial level to receive a community service card. There is no other way to get many single parents out to work than forcing them when they see no benefit financially to work. Bottom line, you be the judge on whether this is MP Paula Bennett’s fault or whether she is just the right person in the right place at the right time to make further progress for women’s rights. • Sole parents whose youngest child is six or older will need to look for part-time work. We’ll help people find suitable jobs that fit their role as a parent and may be able to help with after school care if needed. At the end of August there were 112,500 people on the DPB. Last year 43,000 had a youngest child aged 6 or older. The pro-welfare advocates say this new requirement is "draconian" but it only brings NZ in line with Australia and the UK. Other European countries and the US have a much lower youngest-child criteria. Crucially, what is omitted is some sort of rule to prevent addition of children to the benefit extending eligibility. • People who are unemployed will need to reapply for Unemployment Benefit every 12 months. A case manager will work with people to complete a comprehensive work assessment to determine what they can do and how we can help them find suitable work. A yearly reapplication should be the very least that is required. • People who are unable to work due to illness will be encouraged to look at what they can do. From May 2011, if someone is assessed as being capable of working at least 15 hours a week, they’ll be expected to look for a suitable job. • People on Invalid’s Benefit will see no change to the eligibility. We will continue to support those people who are unable to work because of permanent and severe sickness, injury or disability. • People applying for Hardship Assistance will be given more help to manage their money. • A young person supporting themselves on Independent Youth Benefit will be encouraged to stay in education or training that will better prepare them for future work. Encouraged. What does that amount to? Why not 'required' to stay in education and training? All in all these changes are fairly wishy-washy yet have taken almost two years to implement (in the case of changes to the sickness benefit, almost 3). They will modify how compliant and motivated beneficiaries behave, but those who are only interested in the status quo of their current situation will find ways around them. In some respects the changes may provoke some very unwelcome responses, especially among the existing and would-be DPB population. Dependent children - their own or someone else's - will remain the key to long-term eligibility.